Indian Railways’ Train 18 now with a new name 'Vande Bharat Express', may soon ply on the Varanasi route. As a matter of fact, India’s first self-propelled 160 kpmh capable train was introduced to replace Shatabdi Express trains. According to the two sources in the know-how of the matter, many routes are in consideration for the upcoming train. Out of them, some also connect Varanasi. Besides the Delhi-Bhopal route, Patna-Varanasi, Lucknow-Varanasi and other are under considerations as inaugural routes for the train. Previously, Indian Railways pointed out that India’s fastest Shatabdi on the Delhi-Bhopal route will be replaced by the first Train 18 prototype. However, the Railway Ministry hasn’t come up with any finalized route yet. 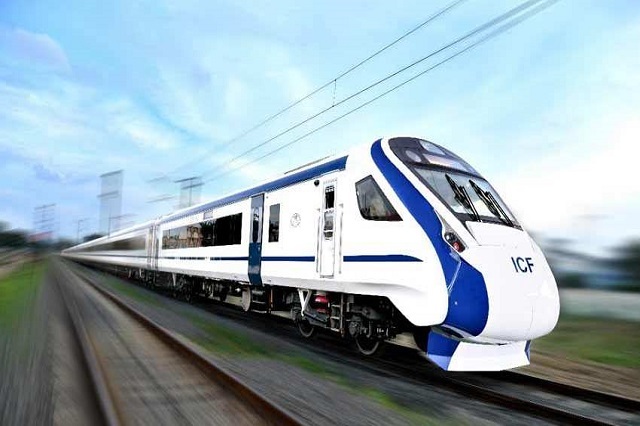 Interestingly, the manufacturer of Train 18 aka Vande Bharat Express, the Integral Coach Factory (ICF) in Chennai, will start working on the second rake in December. According to an ICF official, the second rake of Train 18 is expected to be ready by February 2019. RDSO is currently working on the trials for Train 18. However, the latest air-conditioned engine-less train may run only by January 2019. Thus, there are chances that Train 18 may ply on both Varanasi and Delhi-Bhopal routes with two rakes. What’s special about Train 18 or Vande Bharat Express? Coaches: Train 18 is an LHB platform 16-coach air-conditioned chair car with executive and non-executive coaches. Increased speed: The train boasts of several firsts – an all underslung self-propulsion system, rigid couplers for jerk-free rides and ability to decelerate and accelerate faster. All of these come together to reduce the total travel time and increase the speed. Rotating seats in the executive class! RDSO is making Train 18 undergo extensive tests on various stretches of the Indian Railways network. Train 18 aka Vande Bharat Express will also undergo tests on some parts of the Delhi-Mumbai Rajdhani route at speed of around 180 kmph. According to the sources, the trials are expected to get completed between December 15 and December 20. Thereafter, RDSO will analyze the data and will prepare a report. The train will get a green signal to run after the final nod from the Commission of Railway Safety (CRS).